Native to northeastern Mexico. It is a large tree, reaching 60’ tall or more. The lobed leaves are also large at up to 8” wide and are smooth green on the top but cottony white to silvery below. It has attractive exfoliating bark that is white in winter. It is well adapted to dry, rocky alkaline soils but adapts to moist soils as well. 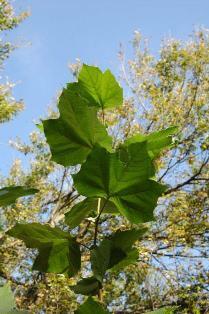 As opposed to the native sycamore (P. occidentalis). 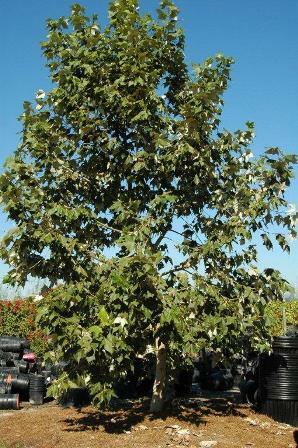 Mexican sycamore is a good choice for the Gulf Coast due to its tolerance of various soils. NATURAL HABITAT AND PREFERRED SITE: pyramidal growth habit, fast growing to a height of 60'-100' tall. BARK: Often are multi-trunked bearing smooth, mottled gray bark. CULTURE: Has spectacular silver-white undersides to the leaves & the foliage stays an attractive green into December. Then it loses all of its large leaves. Not good near a pool. 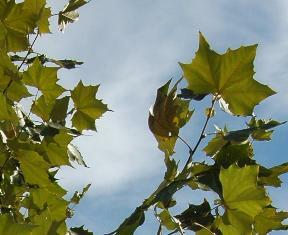 I wanted to let you know that I succesfully treated an Anthracnose ridden Sycamore with corn meal. I treated the ground around the tree once before budding (February) and again about 30 days after budding. The tree is perfectly healthy again. Meanwhile a large Sycamore on my neighbors property that did not receive treatment is infected and does not look like it will survive.